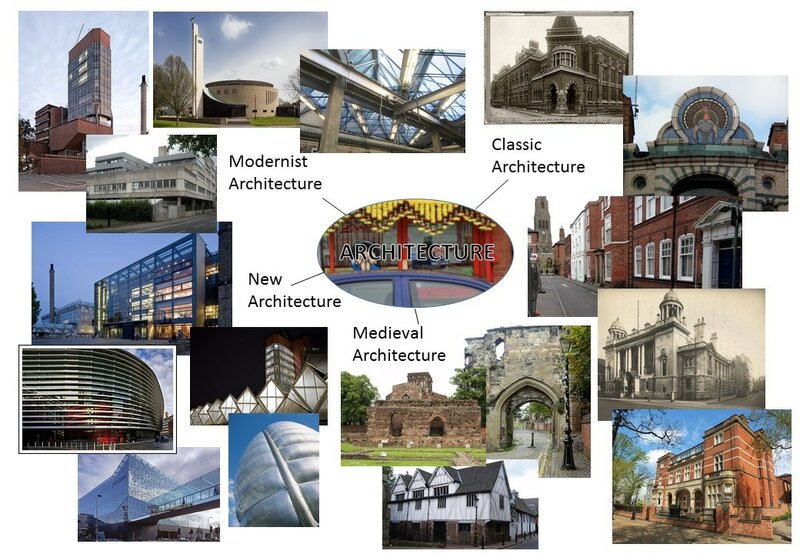 "schools of architecture and design"
"the chemical architecture of the human brain"
Architecture provides a sense of place and support of all types of human activity. Architecture helps the man-made fit in harmony with the environment while promoting health and well-being, enriching lives aesthetically and spiritually, providing economic opportunities, and creating a legacy that reflects and symbolizes culture and traditions. Surrounding us on all sides. Lifting us up and inspiring us. Intimidating by towering over us. Or even sitting comfortably in the background of our lives. Buildings are the structures that define us, move us and make us smile. They give us our identity, dictate ideas of class and privilege. Define the very walls that hem us in, and yet few of us will ever build our own. In the UK only 10% of new builds are self started. Most people make do with old or redundant stock that is overpriced and ugly. The buildings in the UK are badly built and even the new builds lack the vision to excite the new owner for long. Compared to my experiences of building in Europe, where 50% of houses are designed and built by the owners, the UK lacks the system to support individualism and instead makes do with bland carbon copied buildings. City architecture is very important. Lacking the context of nature to soften mistakes Cities require a level of planning that far exceeds their rural counterparts. Creating an attractive, harmonious city that works aesthetically, physically and functionally is difficult. Especially with the waning fads of the 20th Century - the worst ends of Modernism, Brutalism and plain old functional architecture. With the rebirth of the inner city their is a need to create spaces and places that join up. In year 9 we took a visit to Birmingham to look at several ways in which a community can redesign a space in order to create something exciting and engaging. We looked at the Bull Ring, Library and Custard Factory as areas of invigoration in Birmingham.